Things got a little tense Thursday night as people with homes on and near the site of the Piscataway Drive slope failure met with Prince George's County officials to find out when they can go home. FORT WASHINGTON, Md. 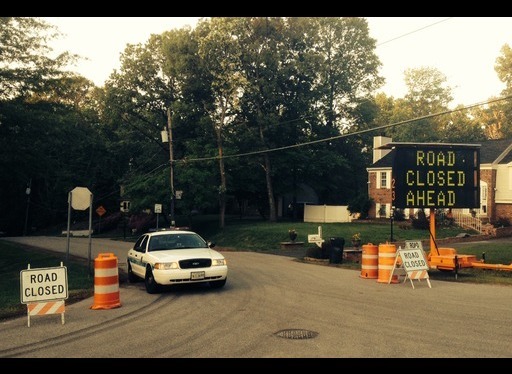 — Things got a little tense Thursday night as people with homes on and near the site of the Piscataway Drive slope failure met with Prince George’s County officials to find out when they can go home. David Lishim, who leads the Piscataway Hills Citizens Association, says his main concern is getting residents back into their houses. “It’s outrageous. I don’t know what to say anymore; they just need to fix the damn road and get people back in their homes; that’s what I say,” Lishim said. But it might be some months before that happens. A nearly 200-page report released to families from the area says that heavy rains were the cause of the May 4 slope failure, and while it contained ideas for repairing the damages, no timetable was given. Darrell Mobley, director of the county’s Department of Public Works and Transportation, says they’ll work as quickly as they can, but first things first. “You have to have water and sewer; we have to make sure the roadway is safe to traverse,” Mobley said. Keith Wilson says his home isn’t one of the 28-plus homes affected, but says he understands the frustrations of displaced families. “The mortgage company doesn’t really care whether you’re living in your house or not; they want their money. And a lot of [people] can’t afford to pay for their house and pay for somewhere else to live,” Wilson said. The Peterson Family Foundation and the Walmart Foundation have agreed to provide financial help to affected families. WTOP’s Ari Ashe contributed to this report. Follow @WTOP on Twitter and WTOP on Facebook.